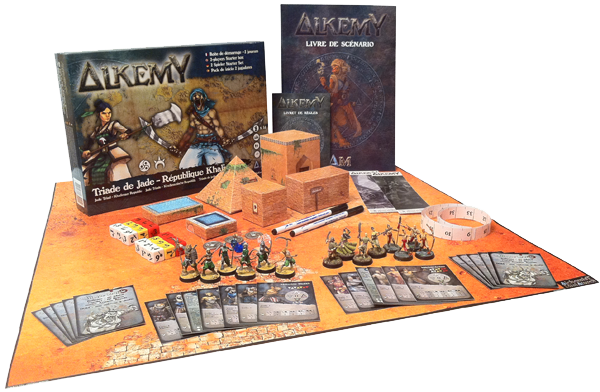 This starter box includes everything you need for 2 players to play Alkemy: battle mats, scenery sets, miniatures, dice, rulebook, scenario book, game materials (tape measure, profile cards, markers, objectives pawns, etc.) and a start quick rule sheet. 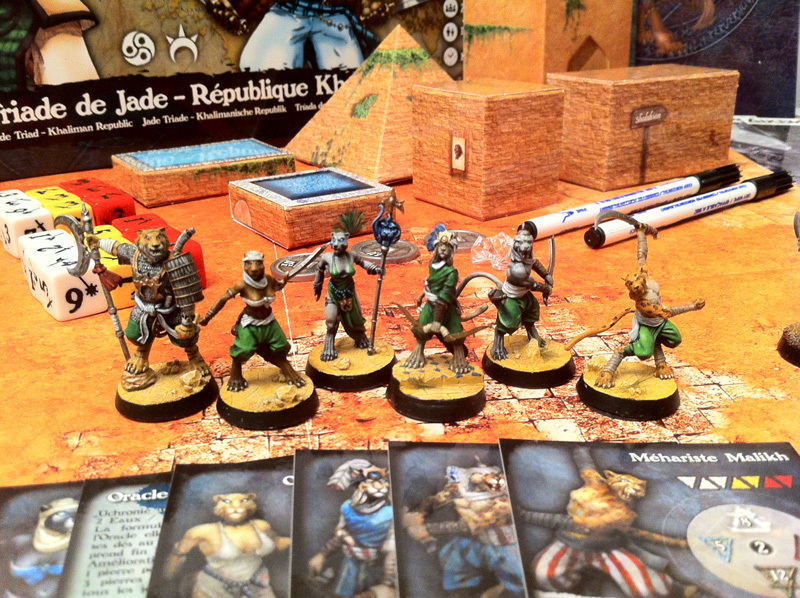 The two armies are the Khaliman Republic and the Empire of the Jade Triad. 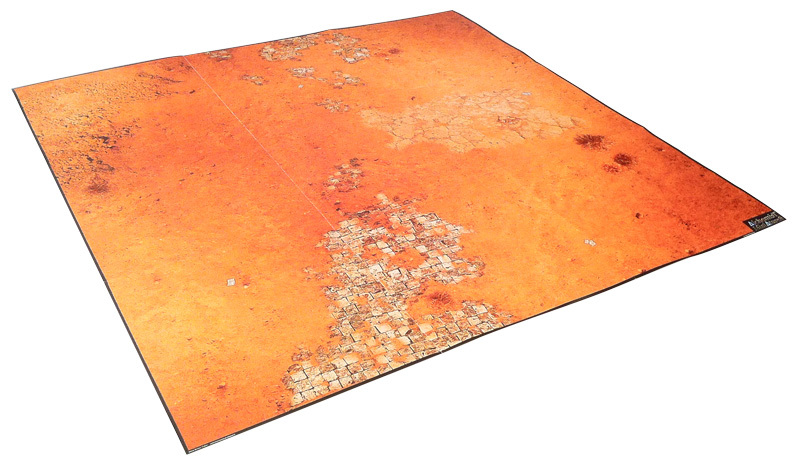 The battle mat is printed in a “Khaliman desert” atmosphere, with a surface of 60 x 60 cm. The 6 scenery sets join the Khaliman atmosphere. They are printed and all 6 scenery sets will take you 15 minutes to assemble and glue. 2 basins, 2 walls, a pyramid and a building will immerse you in the Khaliman lands once placed on the play mat. It’s in A4 format and includes 36 pages, with a narrative campaign for 2 players, 7 scenarios starring Assia Ibn Khalid and his squirrel Orph. 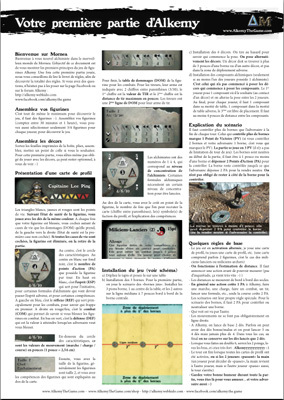 A page is dedicated to the summary of the main rules of the scenarios (goal, zone of deployment, sets, components, victory conditions, etc.) 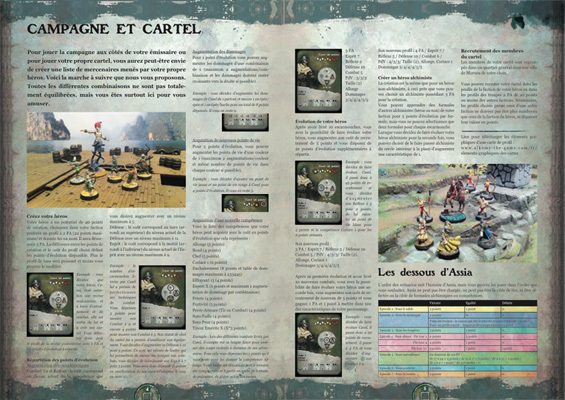 and a table gathers the information and recommendation for the 2-player mode and the multiplayer mode (3 and 4 players). A double page will allow you to create your hero and customize it as and when your games, with a system of point of evolution and the acquisition of new skills. You will also find 9 other scenarios, in version 2, 3 or 4 players, with each time the context, the goal, the special rules, etc. For each scenario, a tactical advice from an experienced player on how to play the scenario as well as his favorite blitz list. 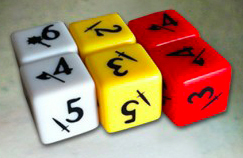 Alkemy has its own unique die system, with 3 different dice colors, corresponding to the health of the miniatures, and with symbols (mass, axe and sword), which when combined by 2, will show you the damage that will make your miniatures. 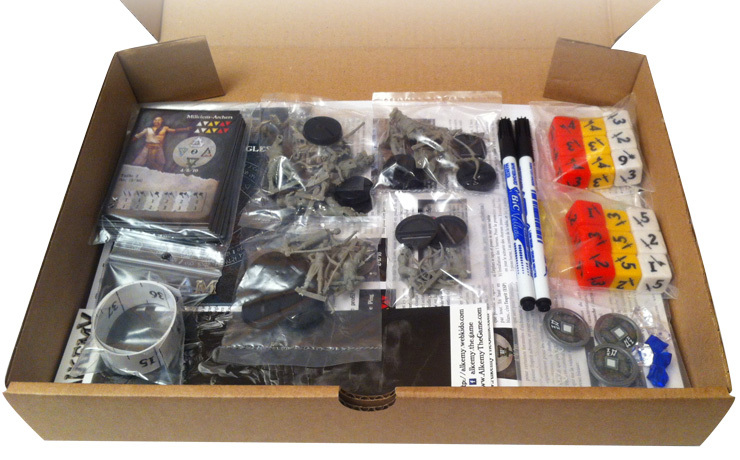 18 dice are included in starter box. The profile cards are linked to the miniatures, they are laminated, you can directly check the life points above with erasable markers, and can erase them instantly. A sheet A4 R° V° (your first game of Alkemy) will quickly explain the rules and setting up a game so you can play immediately.You can then read the rulebook, which will explain in more detail The game’s rules. Rulebook of 40 pages (small A6 format) with the set of rules. Small and practical, you can carry it with you easily, and it can stay next to the game table in case you have a doubt on this or that point of rules. The “small material” includes 6 alchemical components (3 waters for the Khaliman Republic and 3 airs for the Jade Triad), 3 pawns that simulate the jin terminals, and 2 tape measure that will be used to measure during the games. 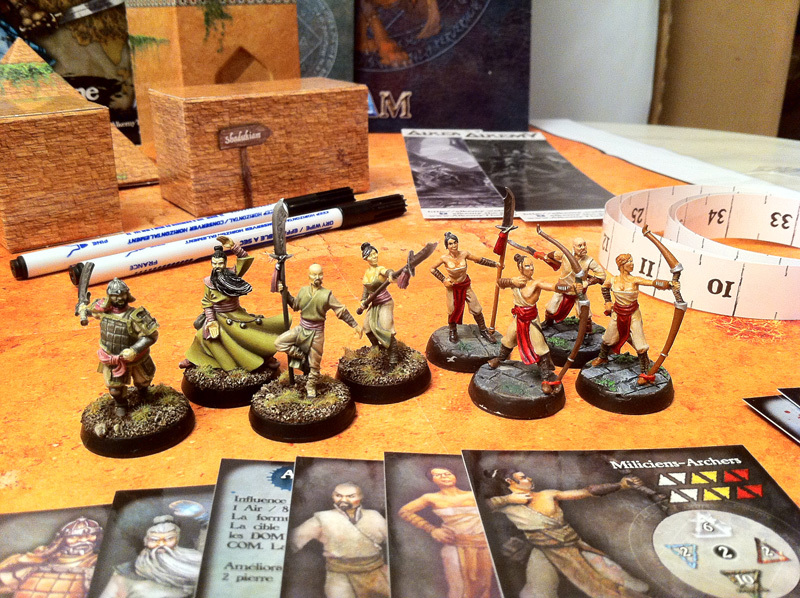 14 miniatures are present in this starter box, 6 for the Khaliman Republic and 8 for the Empire of the Jade Triad. They are plastic, very easy to assemble, usually without the need for glue. Khaliman Republic warband is composed of Araoui, a hero 4 AP (Action Points), one of the best shooters in the game, who can be used to play the scenario or to kill the opposing models. The oracle, alchemist 3 AP who will provide significant support to allied miniatures with its 2 alchemical formulas. A Ghulam, 2 AP elite troop with significant DAM (damage) and Long Reach allowing him to fight from a distance. A Meharist 2 AP and his exceptional ability to move and two Jarayas, base 2 AP troops who will fight the opposing miniatures or play the scenario. Jade Triade warband is composed of Lee Ping, hero 4 AP who is a formidable fighter with his sequential attack skill. The Alchemist of the School of Long Breath, 3 AP, with his famous violent storm that will land the opposing models. 4 militia lancers, 2 AP troops, who will be able to fight at a distance thanks to the Long Reach, and 2 militia archers, 2 AP, who will shoot arrows at the enemies. For whom and how long? Once you have played the first game and assimilated the rules, a game will last on average between 45 minutes to 1 hour. It is very easy to introduce children from the age of 10 years who will quickly understand the rules, and to content the greatest who will push the game in these most tactical aspects. Thanks to the scenario book and those you can find on architekt, this game has great replayability and each scenario is a new tactical experience. Once you have mastered the Khaliman or Triad warband, you will most certainly want to change heroes, change alchemists, elite miniatures or troops, again to test other tactical experiences. These two factions have plenty of other miniatures, which you can find and to download profiles on architekt, and who are also available on online store. The game is very rich and several other factions and sub-factions exist, with many playable and available action miniatures.